Panzanella is an Italian salad made of crusty bread, cheese, tomatoes, oil, and a few vegetables. Ergo, it is deconstructed pizza. I love panzanella for that reason: You can serve it as a “salad,” only it’s a “salad” magnitudes more delicious than “salads” with “greens” and “roughage.” And, hilariously, it seems all summery and light and classy because it’s Italian and you can talk about the expensive heirloom tomatoes you used, blah blah blah, while all the while you’re just noshing on pizza salad. So I wanted to make panzanella for Unhealthy Salads Week. But I was frustrated by its still-somewhat-nutritious aura. How could I reduce that to zero? (This is how my foul little mind works.) 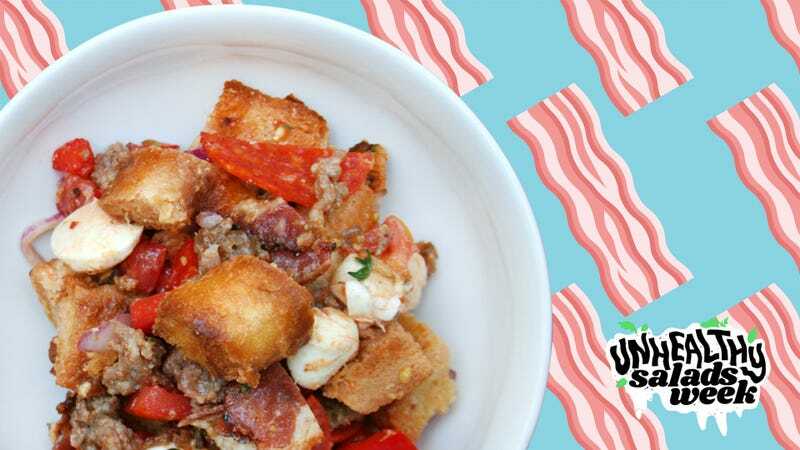 If panzanella is essentially pizza, I reckoned, then I could add meat lover’s pizza toppings. To the deli! The final “salad” is, as one would expect, deeply savory and best served as a main dish. More so even than a pizza, the salad reminded me of the vinegar-drenched Italian cold-cut subs I enjoy whenever I return to my home state of New Jersey. It’s not a total gut bomb, though: The tomatoes and vinaigrette contribute necessary tang, while the bell pepper adds crunch. See, I even snuck a veggie in. A bonus of frying up the bacon for this “salad” is that the rendered bacon fat stands in for the olive oil you’d normally use to coat the bread cubes before toasting them in the oven. (If you take one lesson from this recipe, it’s that bacon-fat croutons are delicious and should immediately become a part of your Caesar salad recipe, too.) Mmm, oven-baked nitrates. Preheat an oven to 425 degrees Fahrenheit. Set a skillet over medium-high heat, add sausage, and cook through. Remove the sausage and set aside. Add bacon strips to the same pan and cook until crisp, remove and set aside with the sausage. Add bread cubes to the skillet and stir to coat them in the bacon fat. Lay bread cubes on a baking sheet, put them in the oven, and toast for about 8 minutes or until quite crisp and light brown. Meanwhile, stir together tomatoes, mozzarella, red onion, Bell pepper, garlic, oregano, red pepper flakes, salt, and pepper in a mixing bowl. Add bread cubes and stir to coat them in the tomato juices. In a separate small bowl, stir together vinegar and mustard, then slowly whisk in the oil, stirring constantly. Finally, combine the bread cube mixture with the vinaigrette, sausage, bacon, and pepperoni. Stir together until well-mixed; ideally, let the salad sit in its delicious juices a few hours before serving.